Critics say Clinton’s private server arrangement put her discussions with some aides outside the reach of government investigators, congressional committees and courts seeking public records from the State Department. Senate Judiciary Committee Chairman Charles E. Grassley (R-Iowa) wrote a letter to FBI Director James B. Comey on July 24 asking him what steps his office had taken to ensure that classified information held on Kendall’s thumb drive, and once kept on Clinton’s server, was being properly secured. A State Department official said that once the agency identified classified material in the e-mails in May, it instructed Clinton’s lawyers on “appropriate measures for physically securing” the e-mails. Even after Clinton’s use of a private server was confirmed there had been questions as to the actual physical location, as Clinton had been vague on this matter. Thus there have been many media accounts of the scandal referring to a “home-brew” server in Clinton’s basement, along with other stories speculating on locations ranging from New York City to other states. This story verifies the presence in Clinton’s home, along with further discussion of support and security for the server. Clinton supporters are trying to write off these stories as right-wing attacks, but the fact is that Clinton knowingly violated the rules in effect as of 2009 regarding use of private email and in failing to turn over any email sent on private systems while still in office. The fact checking sites have repeatedly stated that Clinton’s statements have been false regarding the email on many points. The Washington Post Fact Checker has given Clinton and her defenders Three Pinocchios for their claims on at least two separate occasions (here and here). The top Freedom of Information Act official at the Justice Department has stated that Clinton was in violation of the rules and the State Department’s top Freedom of Information Act officer has called her use of a private server unacceptable. 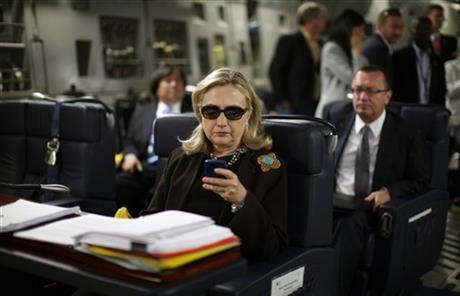 Not only did she violate rules regarding use of private email, she also destroyed around 30,000 email messages and edited others, which includes email related to Libya and Terrorism and was not personal email as she previously claimed. This is a scandal created by Hillary Clinton’s own actions, not by her opponents, and can have serious political repercussions should Clinton be the Democratic nominee. Update: The New York Post is reporting that this is actually a criminal investigation but they base their report on anonymous sources, casting doubt on the accuracy. Posted in Foreign Policy & National Security, Hillary Clinton, Scandals. Tags: Hillary Clinton, Scandals. RSS feed for comments on this post.. TrackBack URL.